The original Movpak, dubbed "the world's first backpack electric vehicle," missed its $100,000 funding goal on Kickstarter two years ago. Now it's back on Indiegogo with a more modest goal ($50,000) and a crazy amount of new functionality. As if building a backpack that converts into an electric skateboard wasn't whiz-bang enough, the new model pairs with your phone over Bluetooth, acts as a mic and speaker, has GPS tracking, headlights, and charges your other gadgets over USB. The new model also has a more reasonably sized remote control, and two motors instead of one for more oomph. Movpak has certainly built a working prototype of this thing, but can it really manufacture something this complicated for backers with $50,000? That sounds unlikely. 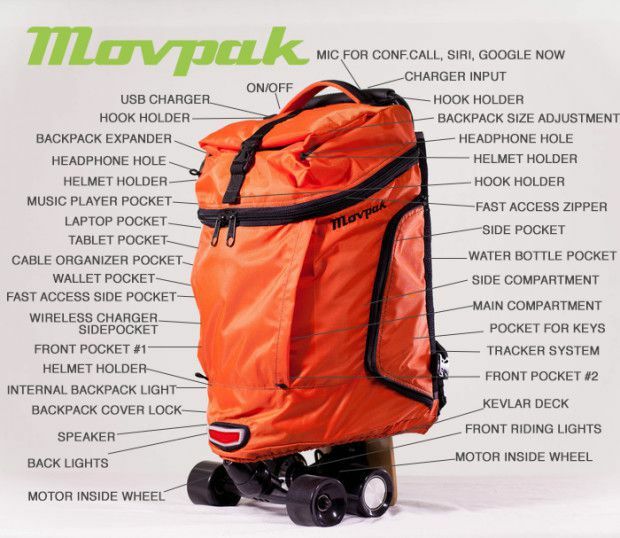 The press release claims Movpak "disrupts" a $4 billion industry, as if commuting via electric skateboard with backpack attached is an idea whose time has come. Which very well may be the case. Who am I to stand in the way of progress? Progress, rolling toward me at 20 mph, with a guy in a suit standing on an electric skateboard which is part of a backpack, sort of. They laughed at Transformers, after all. But for now, I'll just be pleasantly surprised when Movpak ships to backers this fall.